Going to The Getty Museum to see the exhibition of drawings and paintings by 16 th - century Italian master Pontormo, I was prepared to pay homage to this great Florentine painter. What I was not expecting was to fall head over heels for his Visitation (1528-29), a large “enigmatically beautiful” painting that decorates the altar in a small church in Carmignano, not far from Florence. 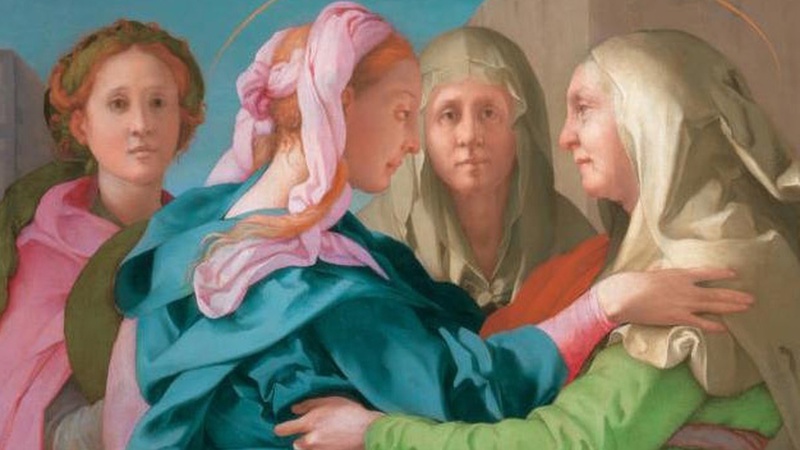 L: Pontormo’s The Visitation in San Michele e Francesco in Carmignano, Italy. 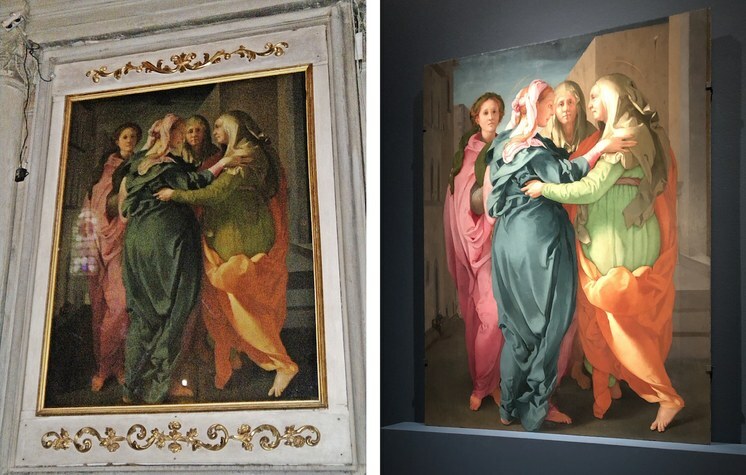 Image courtesy Wikimedia (https://commons.wikimedia.org/wiki/File:Santi_Michele_e_Francesco_01.jpg) R: Pontormo’s The Visitation, restored and on view at The Getty Museum. Photo by Edward Goldman. The painting has been brought to the United States for the first time. It’s been recently restored. And, boy – what an amazing encounter it is. Four women, dressed in billowing robes of exquisite colors, meeting in a plaza. Two of them greet each other – they are Mary and Saint Elizabeth, both pregnant and expecting their sons Jesus Christ and John the Baptist. Two other women, who look directly at us, are servants. In Renaissance Florence, proper ladies would not have been in a public place without attendants. 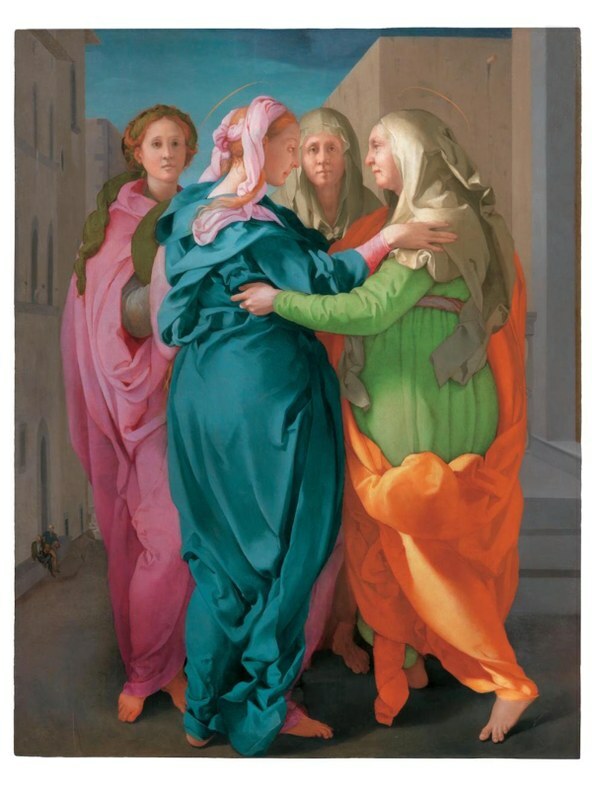 Jacopo da Pontormo (1949-1556), Visitation, 1528-1529. Oil on panel. Parrocchia dei Santi Michele e Francesco, Camignano. Photography by Antonio Quattrone. Image courtesy The Getty. I am not a religious person, so my infatuation with this remarkable image, from the moment I first saw it, was purely aesthetic. The unidealized faces of all four women look real. The composition gives you the illusion that you are circling the women, seeing them from different angles. And, I have to admit, my English is not good enough to describe the vivid colors of their robes. 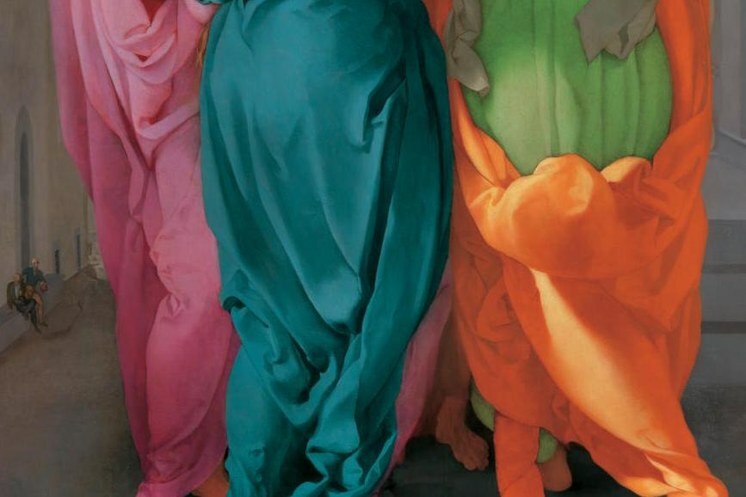 Detail of Jacopo da Pontormo (1949-1556), Visitation, 1528-1529. Oil on panel. Parrocchia dei Santi Michele e Francesco, Camignano. Photography by Antonio Quattrone. Image courtesy The Getty. I would say they are shades of pink, green, blue, and orange. Take a look at the detail image on our website and share with me your more precise definition of these colors…. 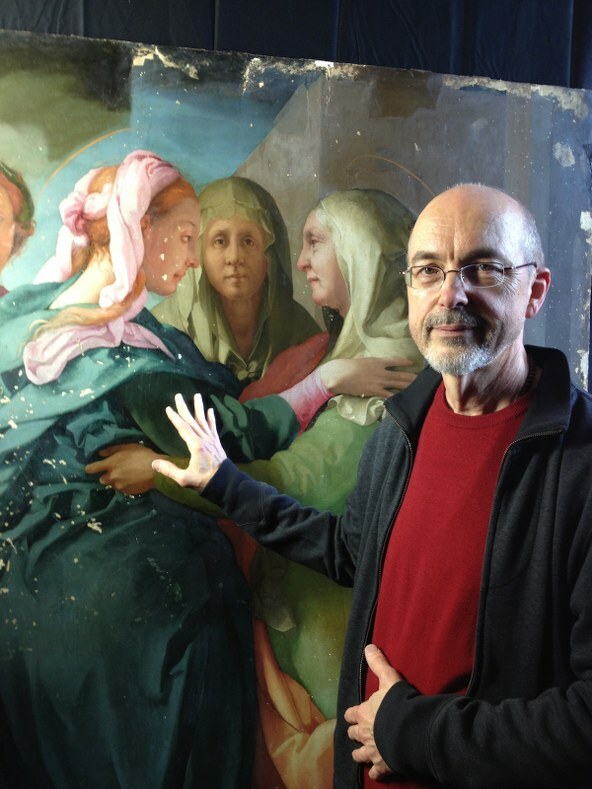 Bill Viola next to Pontormo piece before it was restored. 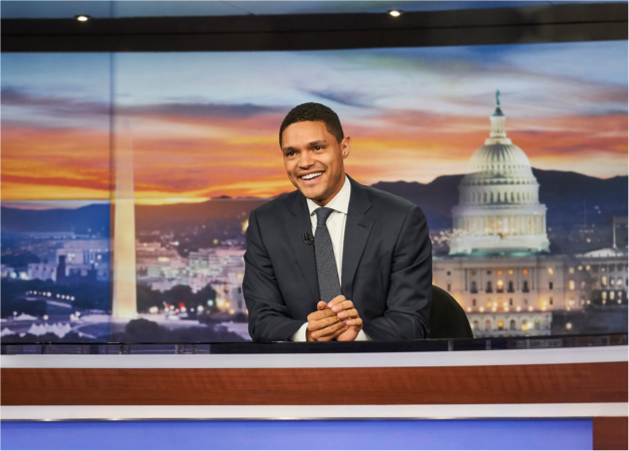 Photo credit: Kira Perov. Looking at these robes makes me think of 20th century abstract paintings. So, it shouldn’t be a surprise that Bill Viola, one of the most famous video artists of our time, was inspired by Pontormo’s Visitation. Installation shot: Bill Viola. Electronic Renaissance. Palazzo Strozzi, Italy. Image courtesy Palazzo Strozzi. In 1995, he created a video, The Greeting, with three women moving toward each other and ultimately embracing – all of this, in slow motion, with their brightly colored clothing flowing in the wind. 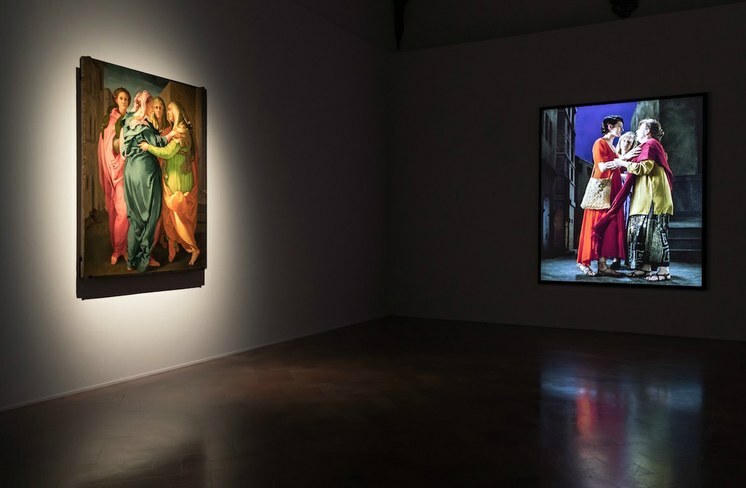 I saw this video as part of a solo exhibition by Bill Viola at LACMA in 1998, but two years ago, Palazzo Strozzi in Florence had the privilege to exhibit Viola’s video in the same room as Pontormo’s Visitation. Screen capture, Bill Viola / Michelangelo: Life Death Rebirth. Royal Academy of Arts, London. Image courtesy Royal Academy. And while we are talking about the inspiring dialogue between Renaissance and contemporary art, here is yet another bridge connecting us with five-centuries-old artworks. 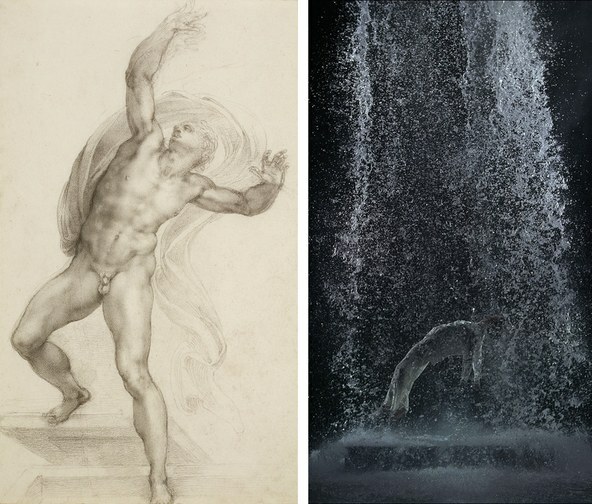 The current exhibition at the Royal Academy of Arts in London presents work by Bill Viola alongside sculptures and drawings by Michelangelo that inspired Viola’s new videos. The exhibition runs through the end of this month, and if any of you, my friends, fly there in the next few days, can you hide me in your carry-on? L: Michelangelo Buonarroti. The Risen Christ, c.1532-3. Black chalk on paper. Royal Collection Trust / © Her Majesty Queen Elizabeth II 2018. R: Bill Viola. Tristan’s Ascension (The Sound of a Mountain Under a Waterfall), 2005. Video/sound installation. Performer: John Hay. Courtesy Bill Viola Studio. Photo: Kira Perov.